The Tanoshiboy Chronicles: Design & Illustration Blog: You're just a little boy in a playsuit, crying for mommy and daddy! You're just a little boy in a playsuit, crying for mommy and daddy! 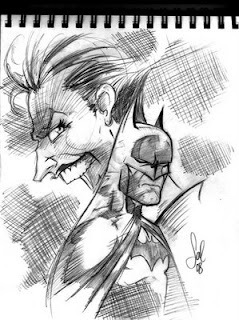 Since Dayne busted out a Joker piece I thought I'd contribute this sketch from a few weeks back. I got the idea from an old NES Joker video game. But who can resist drawing both of these adversaries together?